Meijer is recalling its Meijer brand Ultimate Chocolate Mint Chip Cookies. 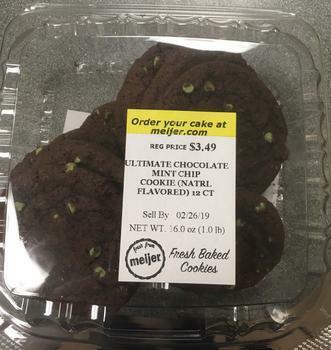 Approximately 720 packages of cookies were sold from February 13 – 20, 2019 in all Meijer stores in Michigan, Ohio, Indiana, Illinois, Kentucky and Wisconsin. Customers who purchased the recalled product should dispose of it or return it to the nearest Meijer store for a full refund. Consumers with questions may contact Meijer at (800) 543-3704, 24/7.